In 2012, Barron's #1 best-selling Tape it and Make It took the crafting world by storm, turning the humble roll of duct tape into the trendiest craft item since glitter glue. Everyone from creative school kids to famous fashionistas began exploring the infinite uses for the toolbox staple, using it to create everything from tote bags to toys to housewares! 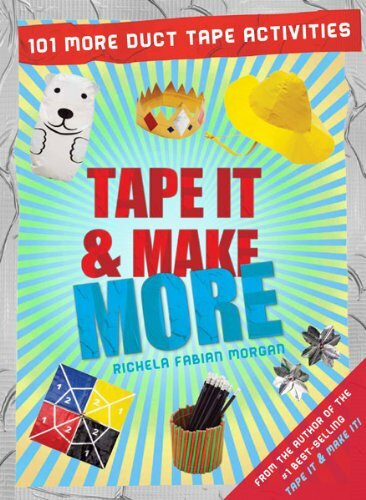 And just when you think we've done everything there is to do with duct tape, Tape and Make It author Richela Fabian Morgan wows us with once again with another round of creative ideas in Tape It and Make More . Who would have imagined that you could make so many unique and amazing items with duct tape? Accessories-- earrings, hats, slippers, a beaded necklace, a bowtie! Housewares-- pillows, a planter, a shower caddy, a hanging room divider! Bags--a sophisticated satchel, a toiletry bag, an iPad case! Toys-- kites, juggling balls, a frisbee, an airplane, a hand puppet! With easy-to-follow instructions, tips on tools and supplies, more than 500 full-color illustrations, and more than 100 cool new projects, Tape It and Make More will inspire crafters of all ages to take their duct-tape activities to new levels! My daughter in the past year has become obsessed with making duct tape creations. From wallets to purses to glass cases and more she has tried quite a bit. This book was a great gift for her because it was filled with so many great ideas even beyond what she has already done. The ideas are laid out in a way that is easy to follow and even for younger people (my daughter is almost 9) she could follow and make the projects herself. If you have a child that loves using duct tape to create a ton of cool objects then I encourage you to check this out today!